Toyin Ojih Odutola, this year’s Lida A. Orzeck ’68 Distinguished Artist-in-Residence, is a rising star in the art world and an important contributor to racial dialogue. As part of the College’s celebration of Black History Month, we honor Ojih Odutola’s work, on- and off-campus, in furthering understandings of the experiences of African Americans and Africans. In the words of poet Claudia Rankine, Ojih Odutola’s drawings “privilege a new grammar of blackness.” Through lines and marks, Rankine writes, Ojih Odutola makes “blackness unfamiliar as it accumulates into flesh to be read as racially significant or not.” In her work, blackness is not one thing: it is a collection of diverse, fluid, and always-changing identities. 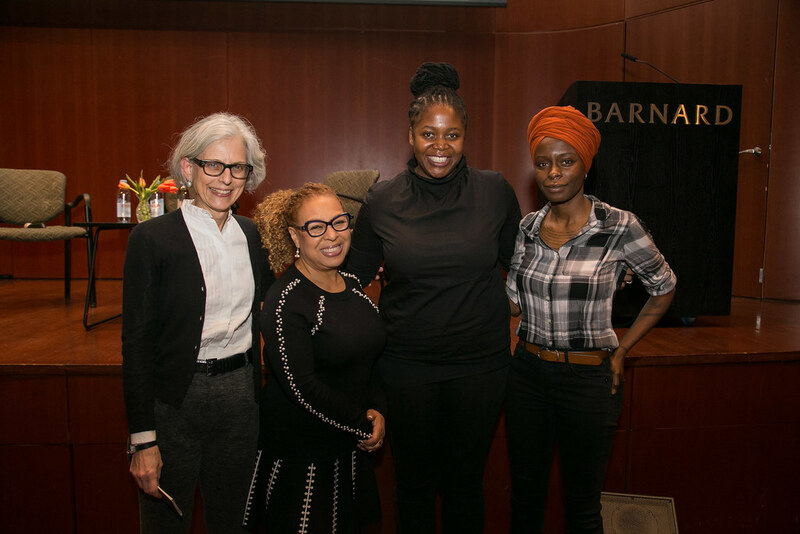 Barnard inaugurated Black History Month on January 31 at the Diana Center’s Event Oval with a dialogue, “Art and Equity,” between Ojih Odutola and Mary Sibande, Johannesburg and Venice Biennale artist. It was moderated by MacArthur Fellow Kellie Jones, a Columbia University Professor of Art History. What political role, they discussed, can artists play today? Toyin Ojih Odutola discussing “To Wander Determined,” her exhibition at the Whitney Museum, on November 1, 2017. Photograph by Robert Wright for Barnard Magazine. On November 18, 2017, Barnard students met with Ojih Odutola at the Whitney Museum, where the artist trained them to speak about her work and share their expertise with others by giving museum tours and discussing her art on social media. Ojih Odutola’s solo exhibition is on display at the Whitney Museum through February 25, 2018. Professor of Art History Anne Higonnet presenting the works of Toyin Ojih Odutola at an event for the Barnard community on December 3, 2017. In the latest issue of Barnard Magazine, Harvard's Richard L. Menschel Curator of Photography Makeda Best '97 writes about Ojih Odutola’s strikingly original work.